With Olympic preparations moving into top gear, the team behind the award winning public health project – Be active – is challenging Birmingham to shake off its reputation as an unfit city. On Wednesday July 27th – exactly a year before the London 2012 opening ceremony – people across the city are being urged to tell the world exactly what they do to stay fit and active. From walking the dog, cycling to work, running in the park, going to the gym, swimming or having a game of cricket or tennis, all the activity counts and needs to be recorded to prove that Birmingham really is fighting fit. 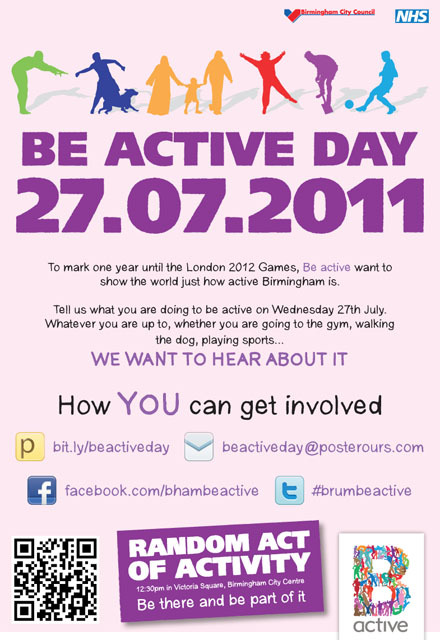 This entry was posted in Events and tagged 27.07.11, Acocks Green, Be Active, Birmingham, Cottesbrooke Junior School, Health Exchange, Olympics, walking group. Bookmark the permalink.